Looking for a sweet treat with a difference? Try Kawaffle! Serving up freshly made desserts with scrummy fillings and toppings, including blue bubble gum ice cream, tasty strawberries, melted chocolate and all-time favourites smarties, to name but a few. 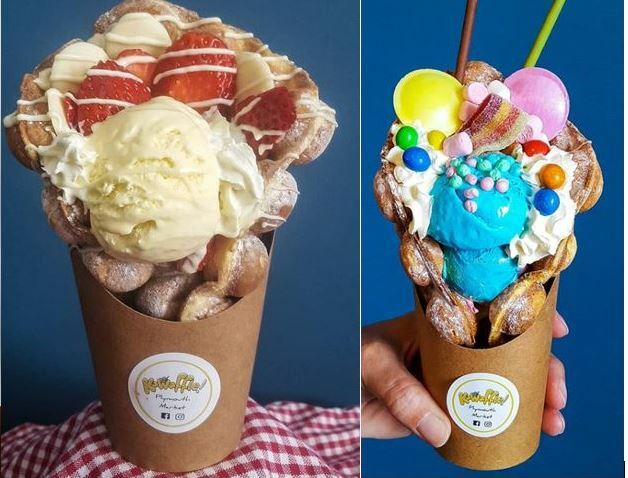 Banana, caramel, cream, Nutella, peanut butter, chocolate sauce, Oreos, Twirls, as well as tasty toppers are among the fillings and mixes available at Plymouth Market’s Kawaffle. And the fun doesn’t stop there; you can also choose from lolly waffles, hot chocolate and milkshakes too. If you’re vegan and eat gluten-free, Kawaffle will be able to cater for you too.